Once there was a teddy named Tim. Tim was Mama’s bear when she was a little girl. Tim rested in a rocker between two stuffed pillows. One day, Abby asked her mother, "May I play with Tim?" Mama smiled and put the bear into her daughter's arms. But Tim looked sad. So Abby played cards with him. “Go Fish,” she said to Tim. Abby played board games with him. But no matter what games she played or what books she read, Tim always looked sad. One day Abby gave Tim a party. Abby put a hat on Tim. She sat him in a chair. She put out plates. She put out cups. His button eyes followed her. Tim looked sad. Mama gave Abby and Tim a cookie. She poured them cherry juice. Abby sipped the sweet drink from her cup. Then she gave Tim a sip. Tim took a big drink. It splashed his face just under his nose and left a curled stain. Abby looked at Tim. Tim looked different. He was happy when she played games with him. He was happy when she read him books. He was happy at parties. Tim was happy all of the time. Abby smiled at Tim. And Tim smiled back. “Chomp, chomp.” Large chunks of food are chewed and broken into smaller pieces for easy digestion. Permanent teeth have to be strong to last a lifetime of chewing. Traveling Teeth: Meet the manatees—mammals with a lifetime supply of brand new teeth! As their old teeth wear out, they produce new teeth and move them towards the front. Traveling teeth? That is hard to believe. After all, teeth, like trees, have roots. Dentists speak of root canals and pulling out teeth by the roots. So how do teeth move? You know that human beings have two sets of teeth over their lifetime: deciduous (milk) teeth are replaced by the permanent teeth. This is known as diphyodont teeth replacement. Most mammal tooth replacement works in this fashion. The Conveyor Belt: Manatees are mammals, but unlike other mammals, they have a generous tooth replacement policy. They are polyphyodont: the teeth are replaced not just once, but many times over a lifetime. Most teeth are replaced vertically. As the milk tooth falls out, a new one grows and pushes its way up, very much like a shoot breaking through the soil. Manatee teeth move horizontally from back to front. Each tooth is linked to its neighbor with strong fibers. When a tooth wears out, its root gets reabsorbed, and what is left falls out. Scientists think that strong fibers pull the neighboring tooth forward to fill the empty space. A new one starts to form in the back. It is almost as if there is a tooth manufacturing factory in the back of the mouth and a conveyor belt carrying new teeth to the front as needed. You will never see a toothless manatee! All-Molar Mouth: Another interesting difference: manatees have only one kind of tooth. They have seven to eight teeth per quadrant, but all of them are molars! They are called “marching molars.” This tooth design may have been influenced by the food they eat. Carnivores need incisors and canines in the front of the mouth to tear into the meat, and molars, placed further back, for chewing. Molars provide a wider chewing surface and are more efficient at grinding food. After all, the root of ‘molar’ is the Latin word mola— millstone. Manatees are vegetarians. Their food consists of grasses and algae, water hyacinths, and all kinds of leaves. They don’t need sharp, fang-like teeth, only the chewing molars. So the front of their mouths has ridged pads on the upper and lower jaws that crush the food, which is then passed on to the molars in the back. Sand in the Food: Scientists say they can tell an animal’s diet just by looking at the teeth. The manatees’ all-molar mouth is a dead giveaway of their leafy, grass-filled diet, which could also be the cause of their tooth decay. Manatees feed off the plants and grasses that grow abundantly in the shallow, sun dappled waters. As they eat, they ingest sand along with the roots and leaves. One can almost say their meal is salted with sand! This sand and the silica found in some stems and leaves abrade their teeth, much as a scouring pad wears away dirt on pots and pans. Marching Molars: Manatees are large, slow-moving mammals who spend most of the waking day eating and resting. Food is plentiful and they have almost no known enemies—their size scares away the smaller predators. “Manatees do not compete for food with sharks or alligators, so there is no need for conflict or aggression between manatees and another animals,” says Courtney Edwards, Staff Biologist at Save the Manatee Club. Why hurry? Try telling that to the marching molars! The most troubling part of this story is troublemakers are encouraged to cause trouble. Like an apple, Burn’s story is filled with tasty sections, but there are a few unsavory spots as well. This novel is the first in her Merits of Mischief series. Seamus Hinkle is the main character and he finds himself accidentally in trouble. The punishment for his misconduct is enrollment at the Kilter Academy for Troubled Youth, a school “far north, wave-hello-to-Santa-and-his-elves north." His parents leave him there in the care of the Annika Kilter. At the academy, students receive their own personnel tablet called a K-pak, which allows them access to Kilter K-Mail, class schedules, assignments, grades, and credits to the Kommissary. In the world of Kilter, credits are actually demerits the students earn by misbehaving. Students are penalized with gold stars for good behavior, which are deducted from their tally of demerits. And each student specializes in a specific type of troublemaking. While the students participate in some disturbing pursuits, the book does include some interesting mysteries. For instance, who is Elinor the “ice queen” and why is Annika mean to her, and what happens to the troublemakers when they complete their time at the academy? The most delectable parts of the story are the friendships formed, the high tech gadgets, and the extra crispy fish sticks. 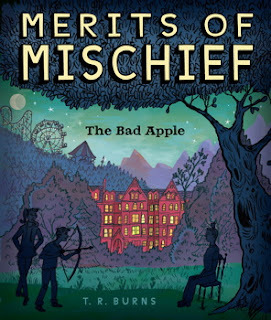 Burn’s considers herself “the tattler of this tale” and she has “tattled others for tweens and teens.” The second book in the Merits of Mischief series is A World of Trouble. T.R. Burns is the pseudonym for Tricia Rayburn. She’s the author of the Maggie Bean series, the Siren Trilogy, and Ruby’s Slippers.